Size and production rather than color pattern have been stressed in the development of the French-Alpine. No distinct color has been established, and it may range from pure white through shades of fawn, gray, brown, black, red, bluff, piebald, or various shadings or combinations of these colors. Both sexes are generally short haired, but bucks usually have a roach of long hair along the spine. The beard of males is also quite pronounced. The ears in the Alpine should be of medium size, fine textured, and preferably erect. 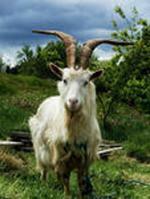 The French-Alpine is a larger and more rangy goat and more variable in size than are the Swiss breeds. Mature females should stand not less than 30 inches at the withers and should weigh not less than 135 pounds. 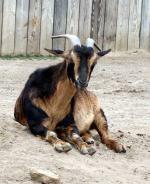 Males should stand from 34 to 40 inches at the withers and should weigh not less than 170 pounds. 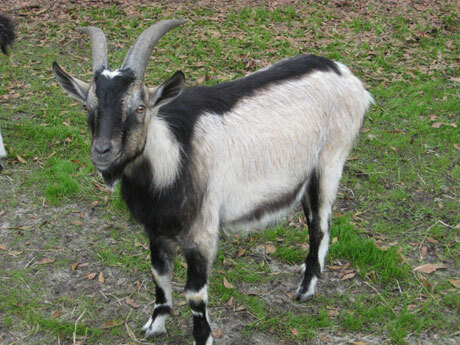 French-Alpine females are excellent milkers and usually have large, well-shaped udders with well-placed teats of desirable shape. Cou Noir (coo nwah) literally "black neck" - Black front quarters and white hindquarters. Sundgau - (sundgow) black with white markings such as underbody, facial stripes, etc. Pied - spotted or mottled. Chamoisee - (shamwahzay) brown or bay - characteristic markings are black face, dorsal stripe, feet and legs and sometimes a martingale running over the withers and down to the chest. Spelling for male is chamoise.